LUHANSK, Ukraine -- The UN humanitarian aid chief has expressed alarm after UN agencies were ordered out of rebel-held parts of the Luhansk region in eastern Ukraine. Some 150,000 people in rebel-held areas of eastern Ukraine were not receiving monthly food distributions, the UN warned. Stephen O'Brien said the agencies had been told to leave by Friday, and several international non-governmental organisations (NGO) by Saturday. The Luhansk separatists had earlier banned 10 international humanitarian agencies citing "violations". Pro-Russian rebels seized parts of the Luhansk and Donetsk regions last year. Almost 8,000 people have been killed since fighting erupted in eastern Ukraine in April 2014, a month after Russia annexed the southern Crimea peninsula. In a statement, Mr O'Brien said the "de facto authorities" in Luhansk had ordered the UN agencies and NGOs to leave the area. 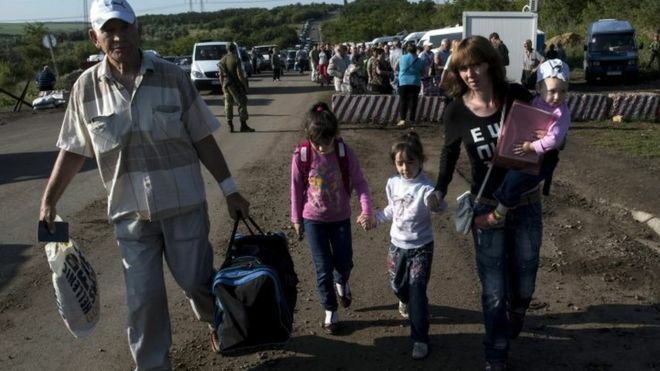 He also said all UN agency operations had been suspended in the rebel-held parts of Donetsk. Mr O'Brien urged the separatists in "both Luhansk and Donetsk to ensure the immediate resumption of UN and international NGO activities". He warned that restrictions on humanitarian shipments had prevented delivery of some 16,000 tons of vital supplies. "Hospitals cannot perform surgery because they lack anaesthesia. Some 150,000 people are not receiving monthly food distributions," Mr O'Brien said. On Thursday the Luhansk rebels refused to register 10 out of 11 foreign NGOs because of "violations". They accused one of the banned NGOs - Doctors Without Borders - of "illegally storing psychotropic medication". The NGO denies the allegation. Ukraine and the West accuse Russia of arming the separatists and also sending its regular troops in eastern Ukraine. Moscow denies this, but admits that Russian "volunteers" fight alongside the rebels. The EU and the US have imposed their own sanctions against Russian officials and top allies of President Vladimir Putin. A ceasefire in eastern Ukraine has been holding in the past two weeks, although there have been reports of occasional shelling.